Newly finished and ready to go, this luxury Lake Maggiore villa offers an exclusive setting for chic family getaways! Complete with private pool and perfect for family stays, this brand new 3-bed villa offers everything you need to kick back and relax. The internal layout is simply made for entertaining; with the open plan ground floor offering effortless access outside, from both sides of the room. Stylish pale wood flooring and chic homely touches and furnishings complement the large sliding glass door, which leads out to a covered dining terrace with views of the pool and the lake. A flat screen TV and payable WIFI provide added entertainment; whilst those looking to socialise the timeless way can savour a dinner party in the fully-equipped indoor kitchen, or outside with a sunny alfresco BBQ. Stone stairs lead upstairs to the generously-proportioned sleeping accommodation. In total, groups of 6 can comfortably be accommodated here. The Master bedroom offers lake views and features a Double bed with sunny balcony. The 2nd bedroom also benefits from lake views and balcony access, and is furnished with a flexible single bed with pull out option. The 3rd child-friendly bedroom is equally versatile, and is furnished with a single bed with pull-out option. Two beautiful fitted shower rooms complete the inviting interior. Bathed in all-day sun, the large private gardens offer the perfect setting for a sunbathe, alfresco meal or a splash in the private outdoor swimming pool. Its elevated setting in Besozzo also ensures the lake views are nothing short of spectacular! From its scenic hillside setting, the exclusive detached villa is just a short walk away from a selection of Italian restaurants, bars, a grocery shop, bank, post office and other useful amenities found in Besozzo. The popular lake beaches and lidos of Reno di Leggiuno, Monvalle, Ispra, Angera and Ranco are within close-proximity of the villa (10 minutes’ drive away). Reno is also home to the majestic UNESCO World Heritage Hermitage site of Santa Caterina del Sasso. Nearby Laveno-Mombello is 15 minutes’ drive away and offers a great range of bars, restaurants, a funicular railway and a frequent morning-late evening ferry service across the lake to Intra (for Villa Taranto and the easy road links to Stresa; for the famous resort attractions and tourist boat trips to the famous Borromean Islands). With whitewashed beamed ceilings and fresh contemporary interiors, the 1st floor sleeping accommodation is beautifully-styled for year-round stays. Ideal as a luxury honeymoon retreat or as a flexible family retreat for 6, the 3-bed villa promises all-round versatility. Bathed in all-day sun, the generous private garden provides a great setting for relaxing and socialising. The sweeping flat lawn is complemented by a spacious covered terrace with alfresco dining area and BBQ. The private outdoor swimming pool invites you to have some fun too and stay cool with the kids. The villa offers a private parking space. Nestled on the hillside of Besozzo Superiore, this elevated part of town affords breath taking views across Lake Maggiore. The sunny villa offers a hassle-free location too; with a selection of Italian restaurants, bars, a grocery shop, post office and bank all within a short stroll away. The charming town is also 10 minutes’ drive away from the well-serviced lido beaches in Reno di Leggiuno, Monvalle, Ispra, Angera and Ranco. For those looking to get out and explore, the ferry, restaurants and funicular of Laveno-Mombello are just 15 minutes’ drive away. The lovely resort town of Luino is also just 30 minutes’ drive away, via the inland road from the town. Aside from relaxed beach days and carefree ‘La Dolce Vita’ days, the area is also perfect for sightseeing; with the Hermitage of Santa Caterina del Sasso nearby in Reno and the Rocca Borromeo castle of Angera both reachable along the eastern shore. The delights of Stresa (including Villa Pallavicino, the Botanical Alpine Garden, the Jazz festival and Isola Borromean boat trips), as well as Villa Taranto are also easily reachable by road from Intra (a western shore town easily accessible by ferry from Laveno). As well as glorious vistas and magical Italianate villas, Lake Maggiore is well-known too for its clubs, wildlife parks, fine botanical gardens, golf clubs and Swiss Italian Alp ski resorts. 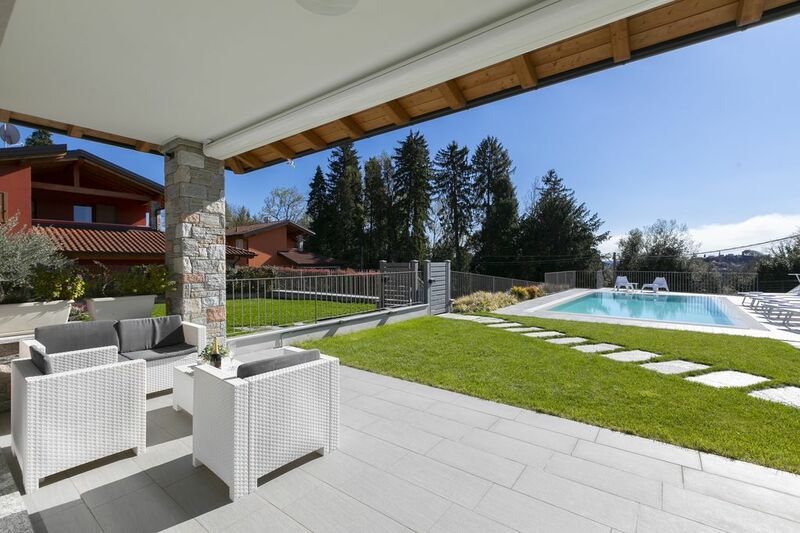 This beautiful villa in Besozzo is perfectly placed for year-round stays; being just 41 minutes’ drive from Milan Malpensa, 55 minutes’ drive from Lugano Airport and 87 minutes’ drive from Bergamo. Lake Monate, Lake Varese and Lake Lugano are all within easy driving distance too for day trips. Villa is located in a nice, quiet location about 30 mins drive north of Milan Malpensa Airport; nicely situated for visiting the surrounding lakes. The villa and the pool were both spotless, with Martina, the point of contact, only a phone call away and very quick to respond when you needed her. We had a very enjoyable and relaxing six day stay and wouldn’t hesitate to return. Sehr schönes und sauberes Haus mit Pool. Problemlose Kommunikation ... immer wieder gerne. We had a great Holiday, everybody was very friendly and helpfull. The Appartement is very nice and clean and we enjoyed the private Pool... we will come back again!